Our lab utilizes state-of-the-art molecular and cellular technologies in our research including the Affy-gene Titan high throughput expression analysis and ABI HT 7900 qPCR. We also ulitilze the UCSF Thoracic Oncology Tissue Bank, one of the world's largest repositories of lung tumor tissue specimens. Csaba J. Peto, Ph.D. is a synthetic medicinal chemist. His primary research focus is the discovery and development of small molecule drug candidates for cancer therapy. 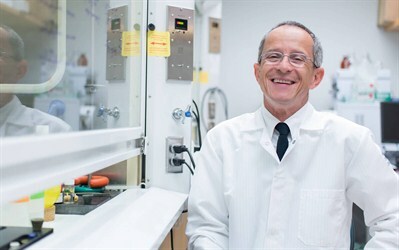 Utilitzing his two decades of experience in the biotech industry, Dr. Peto designs and synthesizes compounds for multi-parametric optimization that target oncogenic signaling pathways. The Tolani laboratory studies targeted therapies, both small molecules and biologics, to inhibit signal transduction pathways, including but not limited to the Hedgehog/Gli pathway, in lung cancer. The lab's research program is focused on overcoming drug resistance by use of combination therapy; employing lower doses of two drugs whose combined effect is greater than either drug alone (synergy) to produce maximal cancer cell death. Thus, we identify and study synergistic pairs of small molecule inhibitors as a therapeutic strategy. We are also interested in targeting Cancer Stem Cells (CSCs) as these perpetrator populations are typically refractory to conventional chemotherapy. Hedgehog expression in CSCs (~1%) are thought to drive initiation, maintenance and survival post chemotherapy of tumor cells (99%) via paracrine mechanisms. In an effort to target the signal source of carcinogenesis, we study the use of biologics to inhibit these pathways. By employing a non-small cell lung cancer (NSCLC) model, we hope to gain fundamental insights that can be translated into clinical advances for patients. The goal of this project is to test potential therapeutics for mesothelioma in our newly developed Cullin 4A (Cul4A)-midiated metastasis model in which mouse mesothelioma cells are directly injected into the pleural cavity of immune-competent mice and to better understand the role of Hippo/YAP signaling pathways in Cul4A-mediated mouse mesothelioma metastasis. This builds on past work in collaboration with Dr. Jian-Hua Mao, Dr. Zhidong Xu, Dr. Yi-Lin Yang, and Dr. David Jablons that investigated the role of Cul4A in genomic instability and tumor development.